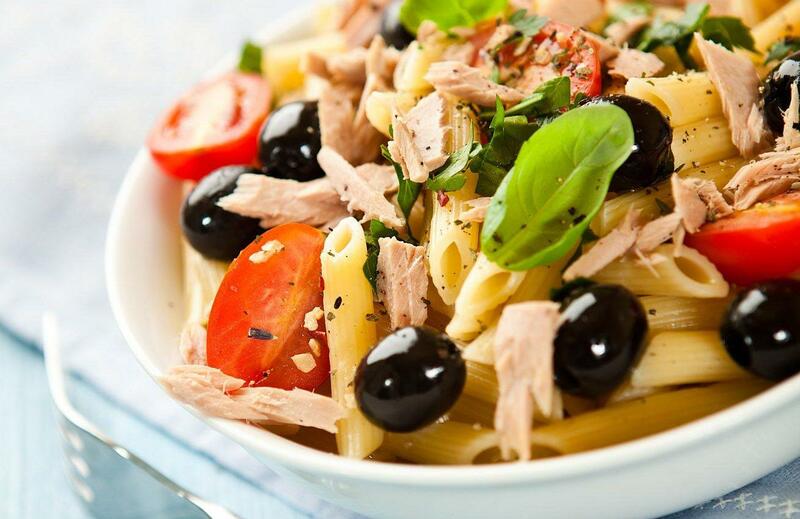 1Begin by slicing tomatoes, cucumber, olives and mozzarella into small cubes and put them in a large bowl, chop the parsley and mix it with other ingredients in the bowl, then add tuna and mix again. 2 Put a pot with water on high heat and when it begins to boil put in a teaspoon of salt and pasta. 3Cook until the pasta becomes "al dente" (means that it is cooked but it is still firm to the bite, if you overcook it, the salad won't be as tasty as it should be). The time for cooking the pasta is indicated on the box, but you can take it out even 1 to 2 minutes before the indicated time. 4 Drain it and put it under the cold running water until the pasta is cold. 5Put it in a bowl with other ingredients, add salt, pepper, extra virgin olive oil and mix it. 6Cover it with foil and refrigerate for at least an hour. If you have spare time it is better to spread the pasta on baking paper and spray it wit some extra virgin olive oil and leave it to cool down, rather then putting it under cold running water. Serve with parmesan sprinkled over the top if you wish.